I had pretty much closed the door on Okemo. As far as races go, it was a downright depressing performance. Not only did I finish last in my age group, but I finished within striking distance of last place. 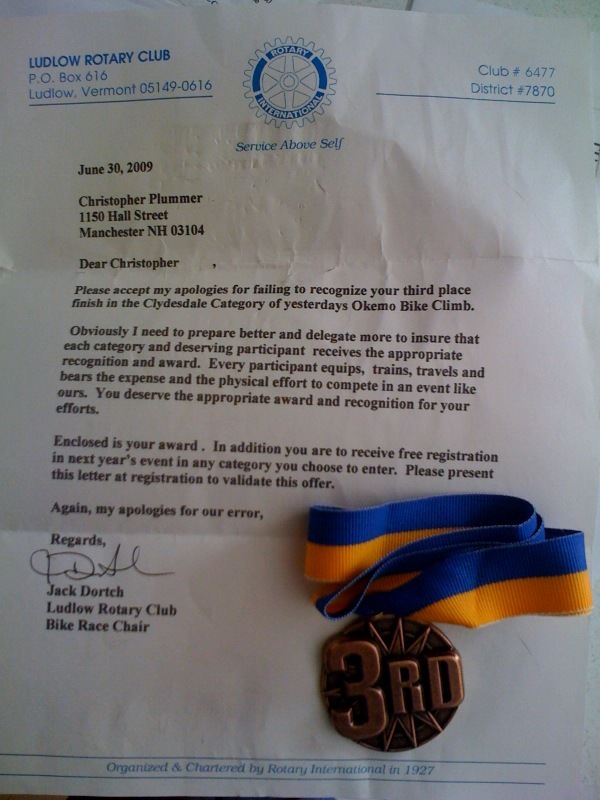 And to cement the hat trick of underachievement, I was eligible for Clydesdale that day and took last place in said category, even though only three Clydes rode Okemo. Hey wait – last out of three…that’s still third place…that’s technically a podium spot right? Alas, it was not. At the award ceremony, Clydes were not recognized for some reason. That’s pretty damn awesome. I was sort of hoping to forget the whole day even happened to be honest. It’s gotta be the worst bike race I’ve ever had. Now, I guess it’s not so bad. This comment should have my email address attached, please drop me a note and I'll send you your Okemo picture.